Islam has rarely been far from the center of the world’s political and security agenda in the decade and a half since the September 11, 2001 terrorist attack against the United States. The range of issues to which Islam has been deemed central is staggering, from transnational terrorism and counterinsurgency in Iraq to the possibility of democracy in the Middle East. These long-running debates have been galvanized over the last few years by the rise of the Islamic State in Iraq and Syria, shocking acts of terrorism from Paris to Tunisia, and the failure of the democratic experiment with Muslim Brotherhood rule in Egypt. 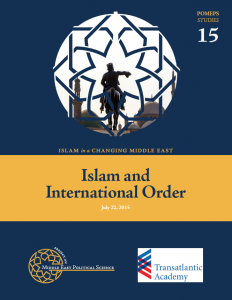 In April 2015 the Project on Middle East Political Science and the Transatlantic Academy hosted a workshop for a sustained discussion of emerging questions on Islam and international order. The two-day workshop brought together a broad, interdisciplinary group of scholars, including area specialists and generalists, from the fields of political science, religious studies and history. The workshop, part of the POMEPS Islam in a Changing Middle East initiative, built on the Transatlantic Academy’s 2015 theme of religion and foreign policy. Peter Katzenstein of Cornell University, in his keynote address, put the question of Islam squarely within the racial and civilizational politics of a declining American imperium. This historical and global perspective provoked a wide-ranging discussion. Islam has played many roles in many different regional and global political orders, as Cemil Aydin, Bruce Lawrence and Jonathan Brown evocatively explained. And, as Amitav Acharya forcefully argued, Islam has routinely frustrated the expectations of popular grand theories of world order. The workshop ranged widely over the question of how to think about Islam within global, regional and domestic political arenas, from a diverse range of empirical cases and theoretical literatures. Can Islam really be understood as an actor, with interests and a coherent identity? Is there something unique about Islam that prevents it from being treated theoretically like other cultural traditions such as nationalism, ethnicity or ideology? Should Islam be seen as a causal variable or as a context through which actors pursue their interests and fight their political battles? What are we doing, conceptually and politically, when we describe political thought as “Islamic political thought,” movements as “Islamic movements,” or democracy as “Islamic democracy”? The essays prepared for this workshop are available here as POMEPS Studies 15. Several key themes ran through the discussions. First, several of the memos specifically focus on the emergence of the Islamic State. Marc Lynch surveys the central analytical arguments that have been deployed to explain the Islamic State Caliphate’s development, noting the very different policy responses each might elicit. Barak Mendelsohn and Reyko Huang evaluate the Islamic State in the history of jihadist groups and insurgencies, and Lawrence Rubin argues that ideational balancing will prevent the Islamic State from becoming a normal state. Second, many of the authors explicitly consider how political science has – or has not – been able to explain the relationship between religion and politics. Contributions from Lynch, Nora Fisher Onar, Elizabeth Shakman Hurd and Jillian Schwedler highlight the importance of the context – or frames in Fisher Onar’s words – of how scholars discuss religion and governance. Third, several of the authors look at the dynamic at play between Islam and the state. Nathan Brown urges scholars to rethink the state’s relationship to religion. Jocelyne Cesari lays out a sophisticated typology of the incorporation of Islam into state institutions, and Mohammad Ayatollahi Tabaar teases out the role of state Islamic rhetoric. John Owen compares the debate over the prospects for Islamic democracy to similar debates in European history, while Daniel Philpott makes a comparative analysis to demystify the notion that Muslim countries are unreceptive to religious freedom. Fourth, several authors focus on the experience of Islamist political movements in the region. Muqtedar Khan prescribes five reforms that Egypt’s Muslim Brotherhood should undertake, and Rory McCarthy looks to Tunisia to answer, what happens when Islamists lose an election? Together, the essays collected in “Islam and International Oder” offer a diverse, informed study that should help scholars, journalists, policymakers and the public evaluate the immense changes in the Islamist political scene.